I’ve been trying to make sense lately of an avalanche of economic news and social data that has overtaken us and in particular has implications for the young and disenfranchised worldwide. On the one hand bankers, politicians and media magnates in suits have got away with crimes that seem only to empower the apparatus of what is looking like an increasingly discredited and ailing economic system. On the other hand looters are venting their anger by targeting the very consumer goods produced by that system. It’s hard to separate the looming economic collapse from the steady erosion of morality across society in general, yet the traditional media at first seem reluctant to make that connection. Perhaps because they are entirely complicit. Phone tapping and gross invasion of personal privacy were the hallmark of Murdoch’s now discredited tabloids. Perhaps the tattle tale gossip was a tonic aimed squarely at deflecting attention by the masses from the really big issues facing the world? At first glance there may seem to be no connection between double-dipping politicians, eavesdropping media and riots. But England is clearly a nation in crisis on many levels at present and where England goes others in the Eurozone are sure to follow. That has implications for global sentiment, which impacts on small trading nations such as ours. Now Prime Minister John Key is promoting a poor card for young beneficiaries in an effort to curb welfare dependency and the misappropriation of state funds. Isn’t this precisely the kind of misdirected, pandering politics that brought England to its knees? More importantly, where is the leadership vision that will drive meaningful economic growth, promote education and create jobs for young people instead? There was one good news story however. According to a recent report on the economic cost of failing to invest in early childhood, it turns out we beat Turkey and Mexico in an OECD ranking of social spending in this area. That is simply embarrassing. Matt McCarten’s piece in the Herald last weekend once again laments the passing of waterfront unionism and 1950s style welfare. But it teaches us nothing at all about the real reasons why the exodus to Australia continues unabated, nor about the real challenge that lies ahead. Our kids aren’t leaving because welfare got dismantled, nor even because silly old men say dumb things in public sometimes. They are leaving because successive governments of all hues have consistently failed to create and pursue an overriding grand vision that diversifies the NZ economy away from relatively low value agricultural commodities and tourism towards applied science, technology and value added services. They are also leaving because we live in a much more open and global society than the one he longs for. I agree with McCarten that concerted attempts to lower wages for youth are misguided. We actually need to increase per capita income – across the board. That means creating more opportunities to generate wealth and it means cultivating a highly educated workforce that thrives on such opportunity and has a sense of purpose. We can’t compete on size, so we must compete with our brains and our wit instead. I believe New Zealand is already at a cross roads. Whilst on the one hand we have recently suffered the worst recession and most devastating natural disaster of our lifetimes, we also exist at a time in history when two huge global economic powerhouses are emerging on our doorstep. Instead of lamenting the loss of skills to Australia, we should be working in close partnership with our western cousins to build global companies that are capable of taking our talent into these developing markets. Parting the waters of the Tasman Sea need not be a negative. Our children have become the first generation of global citizens that have been digitally connected since birth. It may not matter that they reside in Sydney but commute to an office in Auckland or Shanghai. What matters is that we instill a deep desire to build something that creates value for New Zealand. Kiwis should not be discouraged from going global, they should be emboldened. Next week I’m heading to the Ice Ideas conference. I’m looking forward to being inspired by fellow entrepreneurs who have done exactly that. Just when we thought common sense had prevailed, the sneering face of Wellington Airport’s Australian born CEO appears in the media to inform us that the hideous and ill-conceived “Wellywood” sign will go ahead after all. Haven’t they got better things to spend their time on? First it was the turd shaped international terminal, then they wanted to block off a public roadway, now the ridiculous “Wellywood” sign is back on the agenda. It’s clear that Wellington International Airport Limited (WIAL) have no interest in considering public opinion when it comes to their development plans. What is less clear is why 34% shareholder Wellington City Council is not strongly representing the public’s views at board level. Even Mayor Celia Wade Brown admits that the proposed sign is not a suitable reflection of the city. WIAL management just don’t seem to get it. If you want to market a region as creative and fresh, why would you purloin an overused and derivative icon from an entirely different culture? Furthermore, why would you enflame the public with such a thoughtless and arrogant approach? The “Wellywood” sign concept is so tacky and poorly thought out it beggars belief from those of us who love and value Wellington’s beautiful seascape and are hugely proud of the achievements of all the digital creative industries across the city. Majority WIAL owner Infratil is currently appealing to our national pride in a bid to encourage more customers to embrace their newly refreshed and wholly Kiwi owned fuel brand “Z”. Yet they seem oblivious to the conflict that is brewing with the airport’s proposal. “Wellywood” says nothing at all about Wellington, it’s not even funny and it certainly sends the wrong message about our ability to be creative. One can only hope that WIAL management will have a change of heart, for I fear a great many people will not take lightly to having their noses rubbed in it. This week it was reported that our Deputy Prime Minister and Finance Minister gave a speech to a select group of Australian and New Zealand business and governmental leaders. The tone of his presentation made me realise he’s finally thrown in the towel. The government’s astounding vision for New Zealand now apparently involves us becoming the Mexico of the South Pacific, by which our undervalued labour force and weak currency are to be re-branded as “competitive advantages”. Mind you, I have to credit John English for using the current round of budget cuts as an excuse to quietly terminate Don Brash’s ridiculous 2025 Taskforce on “closing the gap” with Australia. The gap is already wide enough to comfortably sail a small fleet of supertankers through it, so the only sensible thing to do now is work closely with Australia to jointly develop high added value products and services for burgeoning Asian markets. Attempting to compete with or catch up to Australia is so completely the opposite of the approach we should be taking that I barely know where to begin. Grappling with what is quite possibly the worst economic crisis of our lifetimes; standing amidst the quicksand of quake wreckage and floundering financial institutions, one could perhaps be forgiven for acts of desperation. But within the same spirit of collegiality shown by our cousins from the West Island, who mucked in and helped in Christchurch, now is precisely the time to talk more about regional associations and tighter cooperation and not how we can under-value ourselves in order to steal a few crumbs off our neighbours’ table. Pansy Wong was New Zealand’s first member of parliament of Asian descent and our first Asian Cabinet Minister. By all accounts she has been an effective and hard-working representative. Her early departure from the halls of government is an unnecessary loss and points to why there is such a dearth of talent amongst our legislators. Whilst Pansy Wong was deciding her future over the weekend, Labour Party President Andrew Little was denouncing Labour MP George Hawkins as a “lightweight” after the retiring MP scuttled a bid to install a pro-union candidate in his safe Manurewa seat. Little is quite right however, Hawkins has contributed very little to the business of government of late. But perhaps Little should have kept this view to himself. No matter. What Hawkins lacked in intellectual capacity he made up for in much needed Labour votes, which is why he was kept on well past his use by date. Wong resigned over the media clamour about her husband doing some business on a tax-payer subsidised trip abroad. Now she wants to retire so she and her husband can get on with their entrepreneurial endeavours out of the public eye. Who can blame her? But shouldn’t we be encouraging our MPs and Ministers to go out and represent the country? If they pull in some more business for New Zealand, how is this a bad thing? With the departure of Wong, Parliament will become less diverse and an even more unwelcoming place for high calibre individuals. Meanwhile, plonkers like George Hawkins will sit quietly on their bottoms waiting to collect fat retirement pensions. Somehow this doesn’t seem right. Last year the government signalled its intention to invest heavily in “primary sector innovation”. As an efficient producer of food with a huge and growing consumer market emerging on our back doorstep, it absolutely makes sense to invest in this area, but it should not be treated in isolation. It also sends a disturbing message that high carbon, environmentally damaging industries are the priority. The official announcement of a $144M investment into the Primary Growth Partnership (PGP) springs from a promise made in 2009 to form a public-private partnership to invest into developing more innovative high value added products and services based upon our existing expertise in farming. But this funding was purloined from an almost identical programme that had already been set up just prior to the demise of the previous government. While the Nats rebranded the package, nothing happened for over a year. In the meantime the global economy tanked and the public’s attention was diverted away from the issue. The recently announced and much lauded additional $189M in funding for high tech industries also sounds good at first glance, but is worthy of closer inspection. It’s spread over four years and is entirely targeted at larger firms. The problem here is that a lot of the most interesting ideas are being generated in smaller companies that are already being hit hard by the recession. Small companies don’t have a lobby group and tend to be way too busy innovating and simply staying afloat to complain anyway. Starting-up and growing a tech company has always been a crucible of fire and only the best and brightest will succeed. That is why I’m sometimes a little bit ambivalent about publicly funded handouts. On the other hand, larger firms now have better access to government grants than smaller one, which seems a little unfair. New Zealand is way too reliant on commodity exports and certainly needs to add more value through innovation. But let’s not forget emerging software and high tech manufacturing companies that build and export high value products and services with almost no pollution or carbon attached. There is a real disconnect between innovation at the coal face within small and enterprises and the resources being made available by government to stimulate these enterprises, some of which will grow to be bigger fish eventually. Under the new system, small companies will self assess their needs and receive training to improve “capability”. That is both laudable and necessary, but it doesn’t help get new products developed and to market faster. Postscript: In response to my friends at TechNZ. My comments above refer to the new funding. There remain avenues for small firms to access co-funding for small projects from the existing funding pool. Chris Carter’s clumsy and self-serving attempt to foment dissent amongst the ranks of the Labour caucus are remarkable but not without precedent. Carter’s brain explosion was never going to end happily for him. Ironically, his irrational behaviour has given the party a rallying point that might actually strengthen Goff’s position as leader – at least for the time being. Chris Trotter’s commentary last week indicates that the Left have washed their hands of the rogue MP. Trotter’s analysis is right on the button. In the wake of losing power and with the departure of his ally Helen Clark it seems like Carter was left in the political wilderness. Too much time on his hands led to some outlandish excuses for publicly funded travel which was the beginning of his unravelling. Carter’s puerile attempt at payback after being sidelined by Goff earlier this year will not have won him any friends amongst the electorate faithful. Carter may well have been right about Goff’s inability to front at the next election but that is a moot point. Goff may have more political nous than he is given credit for. With Shane Jones exposed (so to speak) and Carter shamed, there are very few from within the Labour caucus that would be in contention. In the long term, the leadership will be contested by someone who is not yet even an elected MP but who is being quietly groomed for greater things. In the short term Labour may be willing to sacrifice Goff to an election that might be unwinnable irrespective of the leadership. If the All Blacks win the Rugby World Cup in October 2011 it will be worth 10 points in the polls to the incumbent government. You have to give credit where it’s due. Air New Zealand’s spin doctors have had a delicious time making their engagement with Virgin Blue sound like a huge bonus for customers. Unfortunately the reality of the situation is somewhat different. Our national airline’s lusty desire for consummating a union with Virgin may sound like a match made in heaven but it should not be allowed to get airborne without a proper pre-flight inspection. The two airlines plan to merge and rationalise all their trans-Tasman operations in order to compete more effectively. With Qantas and its low cost offspring Jetstar making rapid inroads into market share and a host of other carriers dumping excess capacity in the region the blue team are taking a beating. It makes perfect economic sense for the airlines to work together, but there is no upside for passengers – especially those from Wellington, where ANZ and PBN already face little opposition. No matter what spin the airlines put on the alliance proposal, there are only two possible outcomes for consumers if it proceeds – fewer flights and higher prices between New Zealand and Australia. That is the sole objective because it is the only way the airlines can get revenue per seat to a sustainable level. The net result is that eventually one brand will cease to exist. 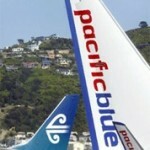 Given that Air New Zealand is entrenched, it is likely to be Pacific Blue that dies. This will also reduce competition on the domestic scene. That would be a shame because both companies are highly innovative and have excellent customer service standards. In any event New Zealand’s domestic market has never been able to sustain more than two airline brands historically and somebody will blink eventually. Then the era of cheap airfares will be over, at least for a while. On the other hand Singapore’s Tiger Airways is waiting in the wings – so to speak, although with its appalling customer service record it is questionable whether Tiger’s arrival would be either beneficial or long-lived. There are however two possible benefits of the proposed alliance to consider. Firstly, Air New Zealand gains access to Virgin’s domestic feeder traffic and marketing machine. That would be a plus for the New Zealand tourism industry and a long awaited return to the Australian market since Air New Zealand’s near death experience with its misjudged acquisition of Ansett back in 2000. Secondly, with more A320s on the way, Air New Zealand will have more capacity irrespective of its partnership status. There may be scope to launch some kind of new low cost option to address this section of the market and placate the regulators. There is a certain inevitability about all of this, so it’s important that any deal gets properly examined. Australia handles such proposals through the Australian Competition and Consumer Commission, but in New Zealand it will likely be a Cabinet level decision. Considering that the New Zealand government is the majority shareholder in one of the applicant companies, that would seem to be a slight conflict of interest. Hopefully a compromise can be hammered out that both ensures the viability of airline services and protects competition in the market. The Pacific Island community was reeling last month after the shock suspension of popular community radio personality Efeso Collins. The gagging came shortly after Collins expressed reservations over an uncontested government funding deal worth almost $5 million offered to a previously unknown economic development trust entity called Pacific EDA. Now the government is scrambling to distance itself from the whole mess, but the story just won’t die. Collins made an empassioned statement during his regular spot on Radio 531pi recently, calling for more transparency but was then dumped by the station management. The text of his comments has been made available on the Pacific Eyewitness blog. Pacific EDA received a direct Ministerial allocation of funding in the 2010 Budget, contrary to advice given by officials at the Ministry for Pacific Island Affairs. Radio 531pi parent company National Pacific Radio Trust receives government funding and is chaired by Tino Pereira. The CEO of the Pacific EDA is one Anthony J M (JR) Pereira. Coincidence? No, the men are brothers and were both directors of Pacific EDA when the company first formed. The affair reeks of political patronage and has been aggravated further by the fact that a journalist appears to have been prevented from doing his job because of vested interests. These efforts will come to nought however because Collins’ friends have ensured the case has been widely aired in the New Zealand Herald and in other media forums online. Collins rightly asks why an organisation with three employees should receive such a vast sum to essentially perform programmes that already exist within other organisations. So, will this funding create more jobs and improved outcomes for Pacific Islanders? Will there be a demonstrable return to New Zealand in general? Those are very good questions. Questions that will no doubt be further explored by the media and the government in the weeks ahead.